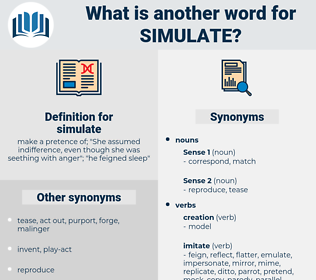 What is another word for simulate? 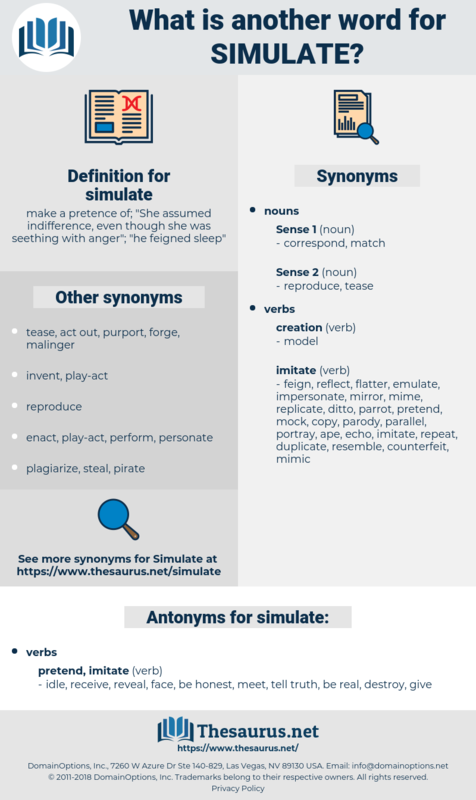 make a pretence of; " She assumed indifference, even though she was seething with anger"; " he feigned sleep"
replicate, imitate, mimic, pretend, duplicate, reproduce, spoof, recreate, represent. idle, receive, reveal, face, be honest, meet, tell truth, be real, destroy, give. Senna Alata, semi-wild, simulated, smell out, similitude, senility, small white, smelt, smollett, small-toothed, simuliidae, Sanwa Millet, sunlit, smaltite.